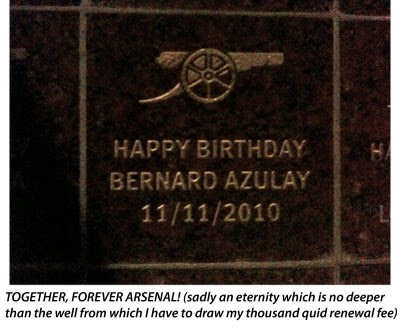 I had to make a stop on the way home from Friday night dinner at my Ma's, after my sister sprang a surprise on me, by revealing that she'd arranged an extremely premature birthday pressie (considering it's not until November), with "a personalised granite stone" at Armoury Square, "where the fans and the legends will be together, forever Arsenal". Ironically, the hypocrisy inherent in a sales pitch which sounds increasingly ingenuous, coming from a club that on the face of it, appears far more dedicated to dreaming up ever more inventive schemes for filching every last disposable pound out of their punters pockets, than it is concerned with putting players out on the pitch capable of rewarding our unswerving loyalty by way of tangible tin-pots, was highlighted by the fact that they've yet to get around to replacing the photo of the recently departed Eduardo, sat atop a stone bearing the inscription "Eduardo Da Silva Arsenal's No 9"
Obviously I couldn't drive past the Arsenal without stopping to check out my stone and although my 18-month phone contract has deprived me of joining the multitudinous flock of sheep-like followers onto the 4th level of the Apple cult, despite the absence of a flash for the camera of my woefully outmoded iPhone 3G, I was able to take the obligatory photo to forward to my far too generous sister, so as to express all due appreciation for my eternal gift. I actually suggested that if she was intent on giving the Gunners so much of her hard-earned dosh, I would've much preferred a present which included the ghost of Herbert Chapman, by way of an apartment in the glorious Art Deco East Stand at THOF. Failing that, in light of the considerable cost of this inanimate lump of granite, I pondered if there might be a possibility of getting a better return on her investment, by having it dug up when my time comes to shuffle off this mortal coil and transposed to mark my eternal patch of turf at Bushey cemetery. 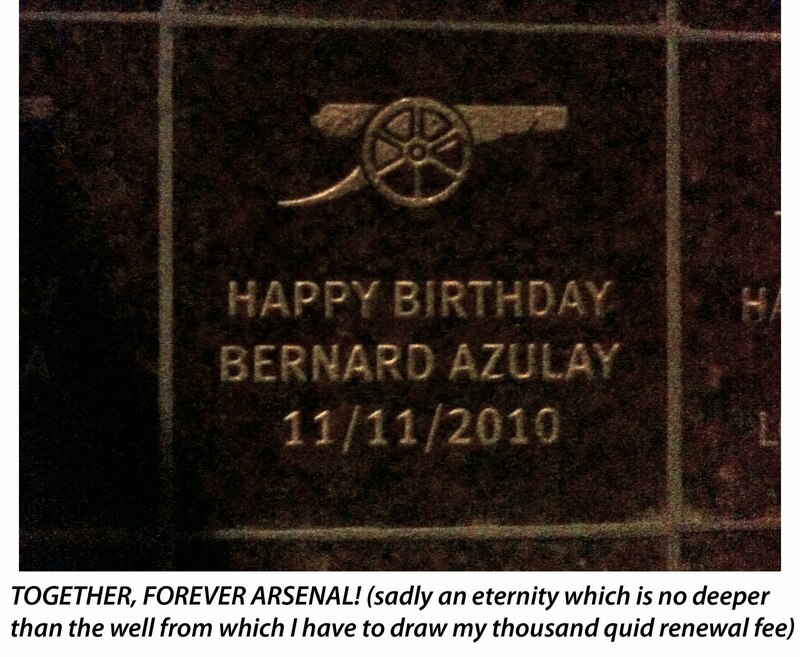 All joking aside, as grateful as I am for my sister's gift and as reluctant as I am to have her feel as if I'm throwing her boundless generosity back in her face, I have to express my mixed feelings about her adding to the amount of money invested in the Arsenal by the Azulay clan. The Armoury Square web site states that all profits will go towards the Arsenalisation of the stadium. It's all well and good encouraging us mug punters to put up the cash for dressing up the vast expanses of concrete around the ground, in an effort to make us feel more "at home". But who, other than us gormless Gooners, have funded the £4 million refurbishment of Club Level, involving the introduction of two new restaurants, the WM Club and The Foundry, where with pre-match haute cuisine priced at a positively obscene £180 and £140 (the latter an incredulous amount for a bleedin' buffet for heaven's sake), at least 95 per cent of us Gooners are never going to be able to afford to find out whether this was money well spent (when at the time of writing we've yet to invest in installing someone between the posts with that crucial Championship winning aura about them!). Obviously one has to assume that the Club's accountants have done their sums and unbelievably, when you consider that affluent Club Level punters need to stump up something like an additional £3.6k to £4.7k on top of the £2-4.5k cost of their Club Level seats, the two restaurants are reported to be 90% and 60% sold out for the entire season already. I struggle to get my head around the fact that in these cash-strapped climes, there continues to be such a rich vein of corporate type punters with seemingly bottomless pockets, capable of spunking up anything between five and nine grand a season for a seat and some poncy pre-match grub. Yet for all the infuriating wind-up of having our new stadium infested with suited & booted big-shots, for whom the quality of the football on the pitch is of trivial importance compared to the choice between the Chateau Lafitte 69 & 71, or between the Beluga and the Foie Gras. I would happily don a penguin suit and serve them myself, if I truly believed that we are going to see some return on the huge sums spent by all these high-rollers, in terms of the sort of purchasing power that would put us in the same category as the predatory likes of Chelsea, Man City and Barca, capable of outbidding any club and offering comparable terms for any player we might desire, or in terms of the equally important reassurance of knowing we won't have to suffer any summer months in the future, fretting over the likes of Fabregas being targeted as their prey and never again having to make the problem of keeping our existing squad intact as our main priority. Sadly four seasons on from the club earning a reported additional £3million plus from every home game, the only evidence of our increased affluence is the plush furnishings for our posh punters and the installation of memorabilia that the majority of us might never get to see. In fact the complete lack of any sign of increased investment on the pitch might lead one to conclude that there are those at the club who are quite happy to maintain the current status quo and so long as the Gunners continue playing to full-houses and wealthy punters keep stuffing their faces, who needs to risk untold millions for the feintest chance of securing a trophy to appease the masses. I can think of a number of pals who originally went into business for themselves, motivated by the thought of providing themselves and their families with a comfortable lifestyle, but who along the way seem to lose sight of this "raison d'être", to the point where the money became more important than the things it could buy. Similarly, one could be forgiven for thinking that a healthy bank balance has become the be all and end all at the Arsenal? Nevertheless the Highbury house of cards is built on the foundation of the cash cow and the kudos of continued qualification for the Champions League and with the ever increasing threat to our highly-prized seat at Europe's top table, if we've been treading water these past few seasons, this is certainly no longer an option, on account of the covetous advances of those opponents who've gradually improved their squads season on season, to the point where we can no longer afford to ignore "the clear and present danger" from the competition. Hopefully we'll get off to a flyer against the Scousers on Sunday and everything will be hunky dory, but should the wheels begin to fall off before the Gooner charabanc makes it out of the drive and a severe reality check puts le Prof on the spot, to the point where he's forced to panic buy, the suits will end up kicking themselves for continuing to kid themselves that Arsène could work the oracle again, without ever dusting off some discoloured pages of an under employed chequebook. The other galling aspect to the Arsenal's current penchant for putting more thought into maximising their income, as opposed to displaying their eagerness to spend it on improving the squad (where the vast majority of us might be able to enjoy the fruits of their efforts, rather than the venal pleasures of the privileged few), is that each new scheme feels as if it's an insidious attempt to encourage already hard-pressed Gooners to demonstrate their devotion to the Arsenal in terms of the size of the wedge we're prepared to pull out of our wallet. If it's not another new replica top, necessary to ensure the kids don't get teased at school for wearing last season's kit (not forgetting that the two new kits this season are to be followed by 125th anniversary outfit next year! ), it's another 40 quid for a 28-character plaque on a seat that you've already paid for. They know full well that folks like myself will turn up for the first home game of the season and on seeing a plaque on our neighbours pitch, we're all going to feel obliged to do likewise. Surely football is the only field of entertainment where one's devotion to the cause can constantly be taken advantage of in this fashion. Where else could they charge extortionate amounts of money for a guaranteed seat, only to be expected to fork out a few more quid to put your name on it. But that's more than enough whinging, by way of a far too long-winded preamble to my opening missive of the season. In my eyes Schwarzer would be little more than a stop-gap, rather than a solution, but who knows, in the time it's taken me to tap out this War & Peace like load of waffle, we could've already signed the Fulham keeper, along with half a dozen other players, to leave me with my foot well and truly stuck in my overly loquacious gob? If you can’t be optimistic before a ball has been kicked in anger, then as a footie fan you’re in big trouble, because for supporters of the vast majority of clubs it’s all downhill from here on in. With Arsenal fans having been so spoilt by the success at the start of Arsène’s tenure, many Gooners struggle to come to terms with the reality, which dictates that with only three major trophies up for grabs, the vast majority of clubs are destined to end every season empty-handed. However the club must also share some of the blame for our inflated expectations. As one of the privileged few with seats in the old stadium, personally I’d have been delighted to remain there forever. The Arsenalisation process has undoubtedly lent some personality and individuality to our impressive glass and concrete arena, but in spite of this, for many of us, our cavernous new home will always feel somewhat antiseptic and anonymous, compared to the intimate feel of our former “home of football”. Assuming folk can afford a hobby, the tickets for which have become more expensive than West End theatre seats (and sadly all too often with an equally sedentary atmosphere! ), aside from providing more Gooners with the opportunity to watch the Gunners, the new stadium project was sold to the more reluctant amongst us, on the basis that the additional income was essential for the Arsenal to be able to compete with the other footballing superpowers. You only have to wander down the wrong end of the Seven Sisters Road to appreciate the self-evident truth in this philosophy. Spurs new stadium plans seemed utterly farcical when launched at the height of a recession. But I was shocked when driving past White Hart Lane the other day, as judging by the amount of land that’s been purchased and the demolition work currently taking place, adjacent to their existing stadium, Spurs are presumptuously already spending the millions they expect to receive from the Champions League cash cow, in their efforts to make their new stadium a reality. Never mind “if we build it, they will come”, supposedly with sufficient finances still a long way from being found, it sounds like more a case of “if we build it, Harry will hustle up the brown envelopes”! I might not be too enamoured with the focus on wooden floors and glass chandeliers, designed to attract the corporate pound and the more affluent high-rollers. In fact while the majority of us plebs went to watch the team train at Members Day last week, Club Level residents were lured to the stadium by the promise of a free lunch at one of the two newly opened haute cuisine restaurants, catering to the punters in the posh seats. Nevertheless, I can appreciate the economic argument, as football clubs nowadays are divided into two distinctive groups. Unless ones club has the purchasing power to join the exclusive band of predators, then all your best players will continue to be their prey. As a result, along with many others, I’m fast running out of patience. To date, four seasons on from the move, we’ve yet to witness any trickle down effect from the reported additional £3 mill matchday revenue, into the transfer kitty and we’ve endured far more than our fill, incessantly sweating out the summer months, knowing we need be more concerned about keeping our current squad intact, than fantasizing about securing the signatures of the sort of megastars that we can’t (or won’t?) compete for. Sure, the Gunners have made some pretense at playing with the big boys attempting to appease the fans, by throwing us the occasional bone in the shape of the talented likes of Arshavin and Chamakh. But for the most part Arsène continues his crusade to unearth diamonds on the shelves at Tescos, unable (or unwilling?) to compete for big-ticket items at Harrods. Hopefully our new French Polack will prove as big a hit as Vermaelen, but in spite of Arsène’s customary reticence for a summer spending spree, the arrivals of the relative unknown Koscielny and the Moroccan striker from Bordeaux was hardly the sort of statement of intent that the vast majority of us were hoping for. Especially when Chamakh was already a done deal back in May. We’ve long since learned the futility of spending the close season glued to the Sky Sports News headlines banner, waiting in vain for the red & white realization of reams of vacuous transfer tittle-tattle. Yet at the very least, I assumed that Arsène’s efforts to flog his vision to Fabregas and dampen our World Cup winning skipper’s desire to return to his Catalan roots, would’ve resulted in le Prof putting the Gunner’s money where his mouth is, with a definitive demonstration of his ambition, of the sort that might reassure Cesc that this campaign was not going to be another Groundhog Day. Who wouldn’t be delighted with the prospect of watching one of the greatest midfielders on the planet for at least one more (last?) season. But sadly Fabregas’ somewhat equivocal statement was hardly the sort of “cri de coeur” that was needed to allay justified fears that London N5 might no longer be the home of our want-away skipper’s heart? Despite pre-season reminders of Almunia & Fabianski’s shot-stopping prowess, opposition strikers will hardly be quaking in their boots at the prospect of taking on one of our triumvirate of timid keepers. Perhaps young Szczesny will prove himself to be the man, but it’s the apparent negligence in addressing our patent need for an imposing personality between the posts, that’s the cause of most concern amongst the majority of Gooner malcontents. Moreover, the likelihood that we’ll continue to leak goals only increases the weight of expectation on the shoulders of our solitary newsworthy new arrival. Despite my concerns over Marouane’s delicately arranged coiffure, it will be refreshing to have a striker playing in red & white who’s not afraid of a “tête à tête”. If our preening new peacock spends half the time strutting his stuff on the training pitch, as he appears to devote to styling his sticky up barnet, then hopefully Chamakh will turn out to be a winner. But it’s barely realisitic of us to believe that Marouane’s ability to redress the situation at the other end of the pitch will prove to be the cure-all panacea for the Gunners’ entire panopoly of perceived frailties. Aside from the two new arrivals, most of the pre-season euphoria concerns the promotion of the homegrown likes of Frimpong, JET (Jay Emmanuel-Thomas) and the great white Gooner hope, Jack Wilshere. We’re long overdue some return on Liam Brady’s production line of promising youngsters. Manny Frimpong is rumoured to be a seriously dedicated lad, in contrast to the disparaging modern-day tendency for the erosion of the appetite of so many rising stars in the footballing firmament, by the trappings of fame and fortune. Sadly, on signing their first contract, no sooner are they ensconced behind the wheel of the sort of flash motor that befits their elevated status, than they are left believing they’ve nothing more to prove. There’s some suggestion that the hiccup in Jack Wilshere’s progress was related to the club’s efforts to keep him focused, with his feet on the ground. Whereas it would appear that in playing in virtually every position on the park, JET’s versatility is both a blessing and a curse. While it’s evident Jay has all the necessary tools in his locker, the dilemma to date has been in deciding where he can best make use of them. Never mind the commercially packaged, glitz and glamour of the Emirates Cup, personally I much prefer the traditional curtain-raiser amidst the ramshackle environs of Underhill. In an age where the beautiful game has become such a remote business, with our heroes permanently closeted away from the fans who pay their wages, it is indeed a rare treat nowadays to be able to get up close and personal with them. It was heart-warming to watch the entire squad (minus World Cup stars) paying their dues, allowing themselves to be pawed, as they patiently posed for photos and signed autographs for their adoring faithful on their way out of the ground. Of them all, only Arshavin ignored all the kids pleading for his moniker and marched straight out on to the coach without deigning to stop and make their day. With full-houses for both days of the Emirates Cup (belying perennial suggestions of a bursting Premiership bubble), I was fortunate to bag a couple of last-minute spares, so as to be able to make my nephew’s trip over from Dublin, with a surprise outing to see his beloved Arsenal in the flesh. Watching the boys (v the Bhoys), it hadn’t occurred to me that my comments might influence the all-important dilemma of whose name to put on the back of his new replica shirt. Needless to say Shava didn’t rate a mention, but Samir Nasri has looked very sharp. Both he and Walcott might feel they have something to prove, following their absence in South Africa. Jake chose Nasri in the end and should Samir end up breaking a leg, doubtless I’ll be blaming myself for putting the bok on him. With the Gunners trotting out in more traditional attire, here’s hoping it’s not just their outfits which bears resemblance to the feats of forty years back and that we can recapture some of the spirit of ‘71. In light of the sort of humbling we’ve suffered, when we’ve rolled over like pussycats in crunch encounters from our more recent past, personally I will gladly settle for proof that our young squad has matured into a pack of alpha males, capable of mixing it with the best of the Premiership pride.